What Happens to Wolves When They're Raised Like Dogs? Wolves and dogs are separated by 15,000 years of evolution, during which time the species have veered off into radically different directions. Dogs still retain many of their ancestral behaviours, but less is known about any latent “dog-like” tendencies among modern wolves. A new study of human-raised wolf pups suggests wolves can become attached to their owners in a manner reminiscent of dogs — but that’s where the similarities end. New research published today in Royal Society Open Science shows that wolf puppies, when raised by humans, display signs of both attachment and affection towards their owners, and that these feelings last into adulthood. The study also shows that extensively socialised wolves are relatively comfortable around human strangers, though they sometimes exhibit a bit of fear. These findings hint at behaviours that may have led their four-legged ancestors to seek out and find comfort among humans, leading to the emergence of those super-cuddly, face-licking furballs known as dogs. Before we get ahead of ourselves, it’s important to remember that wolves — even those raised by humans — are not dogs. Not by a long shot. 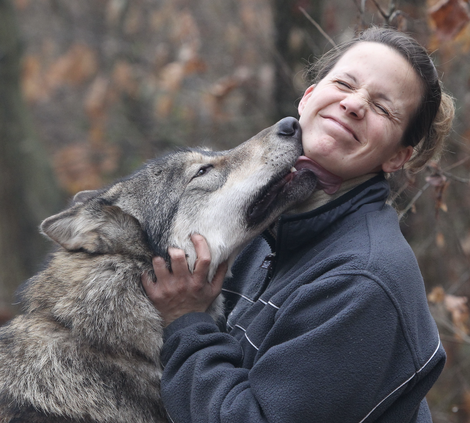 This new study, which was led by Dorottya Ujfalussy from Eötvös Loránd University in Hungary, tells us something new about wolf behaviour, specifically, that wolves can become attached to their human caregivers. It’s a finding that may prove significant when considering animal welfare and human safety issues faced by zoos and conservation areas. But what this study does not tell us is that humans should start raising wolf puppies. Wolves are still wild animals, and human environments are far removed from their natural habitats. Indeed, wolves and dogs are two very distinct species. They may look similar (at least some dog breeds still look a bit wolf-like), but they exhibit profoundly different behaviours. Dogs have developed an intense and natural affinity towards humans, with brain scans suggesting they’re happier around us than they are around members of their own species. When stressed, dogs find comfort in the presence of humans — a trait that’s been reinforced through domestication. Wolves, on the other hand, are naturally wary of humans, fearing our presence and our environments. And unlike dogs, they’re fiercely independent. Wolf pups, for instance, are often left alone when the pack goes out to hunt, giving these animals an almost cat-like self-sufficiency. Unlike dogs, wolves have never had to lean on another species for support. But scientists have also documented some behavioural similarities between dogs and wolves. When greeting each other, for instance, wolves like to lick each others’ faces — a trait that’s all too familiar to dog owners. Wolves are also capable of following a person’s gaze into space, and they understand gestures like finger pointing (not even chimps can do this). Given these similarities, Ujfalussy sought to learn more about the kinds of relationship that wolves, when socialised to humans, can have with their human caretakers. A primary aim of the study was to figure out what makes dogs so unique in their relationship with humans, and where their traits may have originated. Ultimately, Ujfalussy was trying to learn if dog behaviours were already present in ancestral wolves, or if they’re a product of domestication and artificial selection. This new research suggests the former may be true. Previous work had suggested that human-raised wolves, by the age of 16 weeks, don’t show any attachment to their caretakers as dogs do. This implied that only dogs are able to form a strong personal relationship to humans. To reach these conclusions, Ujfalussy’s team conducted experiments using wolf puppies raised by humans. (The experiments were conducted back in the early 2000s, but, due to the authors’ personal circumstances, the results are just being published now.) These wolves came from the Family Dog Project, an initiative founded in 1994 by József Topál and his colleagues to study the behavioural and cognitive aspects of the dog-human relationship. Over the years, this project has yielded over 100 publications in peer-reviewed journals. But for the purposes of this study, participants with the Family Dog Project were asked to raise wolf puppies—and in a way that was identical to how they would normally hand raise dogs (e.g. daily walks on leashes, cuddling, grooming, etc.). The wolf pups used in this study were socialised intensively to humans, making them ideal subjects for experiments to reveal any ‘inborn’ differences. In the two experiments conducted, wolf puppies were put through a greeting test in which they were exposed to four visitor types: their immediate caregivers (or “foster-parents” as they’re called), close acquaintances, people they’ve met only once before, and complete strangers. In the first experiment, eight wolves were exposed to visitors when in the company of other wolves, but for the second experiment, nine wolf puppies had to go it alone. In the first experiment, the wolf pups were six months old, and in the second experiment they were tested at 12 months and 24 months. To keep the interactions as consistent as possible, visitors were told to wear the same clothing, not wear any perfume or cologne, and not have anything in their pocket, along with a host of other control measures. In both tests, the wolves approached visitors of all types readily and willingly. The six-month-old pups flocked to their human caregivers in an “intense and friendly” manner, and they were comfortable in the company of all visitor types. The 12-month-old and 24-month-old wolves likewise approached their foster-parents and close acquaintances with affection, but they were a bit apprehensive when approaching the other two visitor types. No aggressive behaviours were documented, but some of the wolf pups exhibited crouching and tail-tucking behaviours when approaching the strangers, which suggests they were a bit scared. Still, given that some of the wolves were as old as 24 months during the experiments, the results suggest that human-raised wolves will continue to seek contact with humans into early adulthood. “To our knowledge, this study was the first to examine the relationship of intensively socialised hand reared wolves with humans varying in familiarity in a Greeting Situation Test,” says Ujfalussy. Still, it’s important that we greet these results with caution — it’s difficult to discern behaviour from constrained experiments like these. The researchers did their best to minimise confounding factors, but that’s next to impossible; smells, body language, and other variables can interfere with results. Also, there are limitations to studying wolves as precursors to dog behaviour. Dogs are not descended from wolves (at least not modern wolves); both wolves and dogs split from a common ancestor around 15,000 years ago — an ancient animal whose behaviour we’re not able to study. 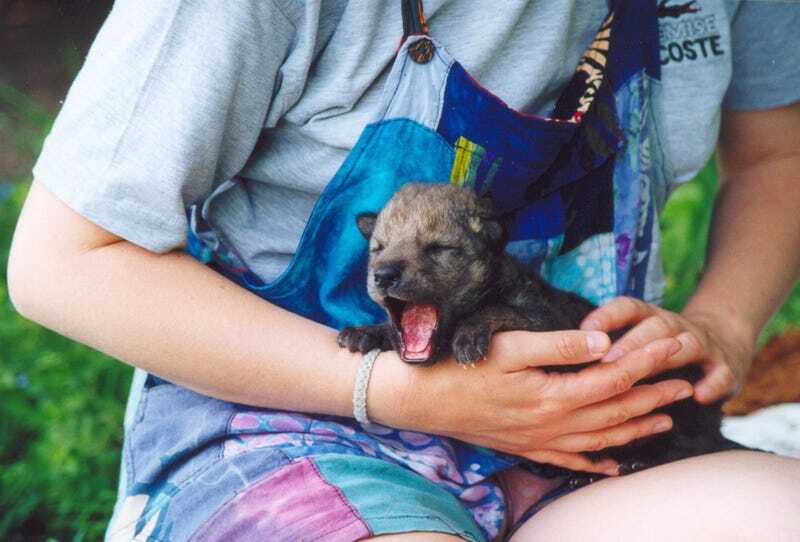 Finally, the sample sizes weren’t great; a total of ten wolf pups were used in the study. Jessica Hekman, a PhD Candidate at the University of Illinois at Urbana-Champaign and a veterinarian doing research in the genetics of dog behaviour, isn’t surprised by these findings, and says this research jibes well with her own personal experience with wolves. One of the the more interesting findings, says Hekman, is that wolves do greet strangers, but still show fear-related behaviours. Obviously, this doesn’t mean we should brazenly approach wolves in the wild. Still, Ujfalussy says we have no reason to be wary or afraid of wild wolves, particularly if they’re given sufficient habitats, where they can live a natural life. Wild wolves under natural conditions avoid contact with humans, she says, and they have a good reason to do so.